While browsing the shelves at my daughter's school book fair this past fall, I discovered The Princess in Black series and asked Mouse if it was something she might be interested in. It was a silly question. Anything about princesses is sure to get her attention. We came home with three books in the series, and she received the fourth for Christmas, soon after it had come out. These chapter books might be a little above her reading level just yet, but the stories are fun and we enjoy reading them together. Mouse is quite taken with Princess Magnolia and her secret identity as the Princess in Black. When wearing her mask, the princess fights monsters wanting to eat the village goats. Princess Magnolia loves pink and parties and is afraid of snails. She wears frilly pink dresses and has a unicorn named Frimplepants. The Princess in Black can hold her own in a fight and rides a pony named Blacky. There's nothing she is afraid of. In the first novel, The Princess in Black, Princess Magnolia has an unexpected visitor who is determined to find out what the Princess is hiding. A window of opportunity to snoop opens when Princess Magnolia's monster alarm goes off. I love the illustrations and how they tell their own story. 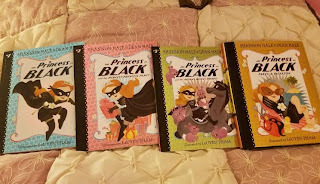 In the second novel, The Princess in Black and the Perfect Princess Party, finds Princess Magnolia struggling to balance playing host at her own birthday party while at the same time being called out repeatedly as the Princess in Black to fight monsters. I was out of breath just reading that one! It's no wonder Princess Sneezewort has some questions. Bunnies can't possibly be monsters, the Princess in Black argues in The Princess in Black and the Hungry Bunny Horde. Her friend Duff the Goat Boy isn't so so convinced. This story one never fails to get Mouse laughing. Tired and in need desperate need of a nap, the Princess in Black has been fighting monsters all night in The Princess in Black Takes a Vacation. The Goat Avenger suggests she take a vacation, and after some contemplation, she agrees, leaving him to guard the goats. Only, it doesn't turn into much of a vacation when a sea monster threatens to eat everyone on the beach. Whenever we read this one, Mouse likes to make up her own stories about climbing or riding the sea monster's back. 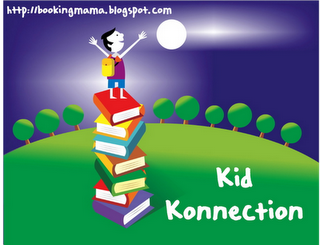 The writing is witty and the stories adventures any young school-aged child will enjoy. In each book, Princess Magnolia must balance her dual identities as princess and hero. She is as sweet and kind as she is courageous and a fighter, and Mouse likes that most about her. The illustrations are well fitted to the story and really add life to the Shannon and Dean Hale's stories. LeUyen Pham captures Princess Magnolia's expressions quite well. Mouse's favorite illustrated scenes in the novel are the ones where the Princess in Black is fighting the monsters. She has a style all her own. Mouse and I enjoy these books, and I imagine will continue to do so for a long while yet. To learn more about author Shannon Hale and her work, please visit the author's website. To learn more about author Dean Hale and his work, please visit him on Twitter. To learn more about illustrator LuYuyen Pham and her work, please visit her website. Eustacia - I haven't read anything by Hale except for these books. I just adore them (and so does my daughter, obviously). :) I haven't read any of these, but I love Shannon Hale's YA novels! Jenclair - I need to give her YA books a try. I love the idea of a Princess super hero! These look so fun! At the Tornado's school for bookfair each teacher had a basket full of books that they wanted and parents could pick a few out and buy them and I bought a ton of these for his teacher. They looked super entertaining and I love that the main character is a princess AND a superhero. Glad Mouse is loving them! Katherine - What a neat idea! I wish Mouse's school would do something like that. I love finding a favorite series to read with kids. My niece and nephew are 2 and I spent Saturday night reading Dr. Suess to them. I will have to keep these books in mind. Dr. Seuss is very popular in our house. Wacky Wednesday in particular. These sound so cute. I don't have any little ones to gift these too but these would be perfect. Melody - I was surprised when I discovered this series that she was one of the co-authors. I haven't read any of her YA books, but I had heard of her before and knew she was well-known. I will have to make a point of reading some of her other stuff. Stacy - His time will come. I feel for you though. Mouse is fighting me a bit less when it comes to trying to read on her own (to me, I mean), but it's been a struggle. I'm glad he's enjoying the Bad Guys Club! Mouse has me read her Strawberry Shortcake comics now and then. I think I need reading glasses because I have trouble reading such small print.